The Goob and I will be at the Ravens’ home opener on Sunday, and we want YOU to come tailgate with us. Find us at the lot on the corner of Ostend and Scott Street (red in the photo). When you walk into the lot, go towards the left where the fence separates the two lots. If you see Tailgate 1, you’re close. Against the fence you’ll see a purple (obviously) Ravens school bus (small size). Look for the guy in the Raven bird hat – you can’t miss him. 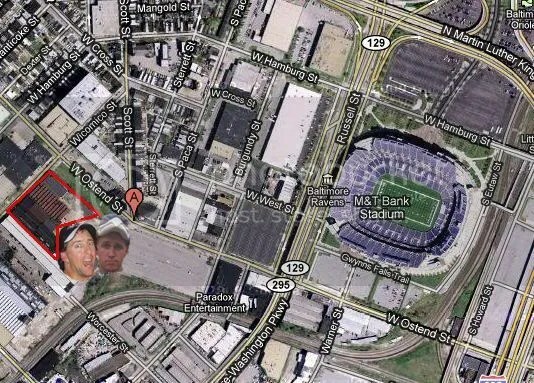 We’ll be there from about 9 AM until its time to go into the stadium (12-ish; no way I miss introductions). Come have a beer and talk Ravens with us! Hell, if you want, you can even get in on our next video segment. We’ll likely be filming another “Sunday Afternoon Still-Drunk,” but this time hopefully on a much happier note. This entry was posted on September 24, 2010 at 11:22 am and is filed under Ravens. You can follow any responses to this entry through the RSS 2.0 feed. You can skip to the end and leave a response. Pinging is currently not allowed.